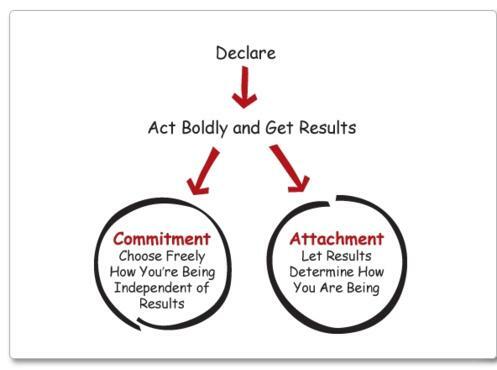 ARE YOU COMMITTED OR SIMPLY ATTACHED? I spent years learning how to set out and accomplish goals in the traditional manner. I wrote down my SMART goals on a sheet of paper—making sure to have every detail laid out. I would accomplish “x” by “y” by doing “z”. I would determine all the variables I needed to track to know if I was successful or not, and I would ensure I had a deadline to hold myself accountable to. And while this model of goal setting has been around for decades, it needs an update. In order to be effective at setting (and accomplishing) goals you must start with your state. Or said a differently “your way of being”. Many individuals who hire a personal trainer want to be more confident. And they feel that once they lose weight that will happen (not a bad assumption). However, more often than not this doesn’t happen. Why? It’s because confidence is a state of being. There is nothing you need to acquire to be confident, you simply have to “be” it. The problem is that most of us don’t create declarations for ourselves. Affirmations, which are often used by top celebrities, athletes, and creative thinkers are not mainstream for people like us. Here is another problem with the traditional model—when our goals are influenced by our results our chance of success plummets. It’s easy to lose motivation or get discouraged when we need to HAVE something first. When our results impact our state it creates a vicious cycle. This is the traditional model of how we interact with the world. Something happens (the result), we emotionally react (our state changes), we do something (our actions). While this works great in positive circumstances, it can be devastating in negative ones. Notice the shift. My state determines my actions and my actions determine my results. Makes a lot more sense, doesn’t it? And my results are no longer influenced by circumstance, leaving me free to act effectively even when things aren’t going my way. First, what is it that you really want? Dream big here. This isn’t about “getting real”. This is about being pure and true—to yourself; your vision; what’s in your heart and on your mind. Second, what state is associated with it? What would it feel like if you had it? Third, what actions reflect you being in that state? For example, if my state of being was “a powerful athlete” my actions would be to workout consistently. These questions can help you get started with a new approach to goal setting. One that puts you in the driver seat and overcomes the inevitable bumps in the road.